In all of our endeavours as an organization, quality remains at the heart of our efforts and commitment. Our constant focus on being a quality-centric organization helps us earn reputation of a market leader. On the other hand, it strengthens our capabilities to deliver substantial business value in each of our engagements. We at GTS strive to invest in our quality management processes and have matured to make ourselves compliant with the principles defined by various industry standards. We keep our quality procedures and practices under a keen watch by conducting regular quality audits across all of our functional departments and project groups. As a result, we have enforced stringent quality policies and guidelines that work in our favour when it comes to our delivery efficiency. 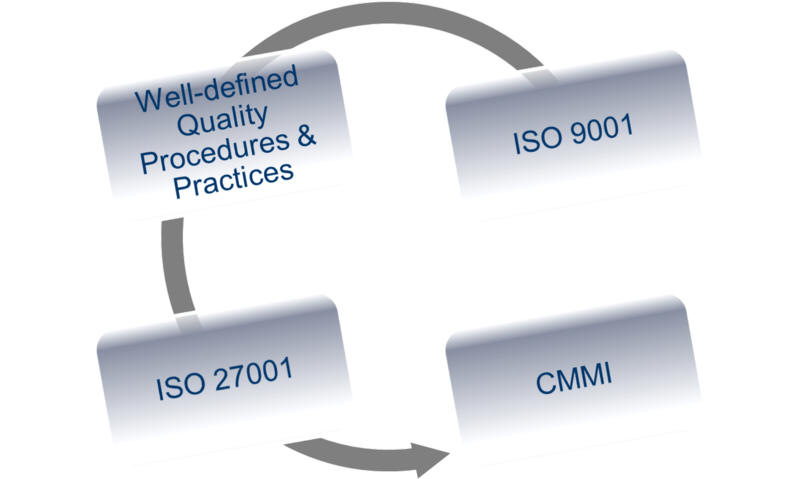 We are compliant with quality standards defined by renowned ISO and CMMi and are soon going to get accredited with ISO 9001, ISO 27001, and CMMi certifications going forward. We rigorously follow the internationally accepted quality standards and make conscious efforts to ensure that our quality parameters are always at par with the customers’ desired quality gates. In our project management processes, quality of the delivery and the processes holds a vital importance. Information Security is of utmost importance at GTS. Given our decades of experience in handling customers’ intellectual property, GTS has in place a mature Information Security Management (ISM) system that helps in effective management of threats and risks to your organization’s confidential information. We meet all the criteria and standards recommended by ISO 27001 and strictly adhere the pertinent quality and ISM processes. Our ISM System addresses two modes of security critical for any organization – Physical Security and Network Security. Physical Security – It includes implementation of facilities like access card, keyboard based control, restricted entry, and manual monitoring to ensure no unwanted trespassers scan through your intellectual and physical property. Network Security – It covers various levels of Network Isolation and Security. With restricted internet access, firewall based control, and multi layers of security, GTS ensures that customer design is safe and secure. 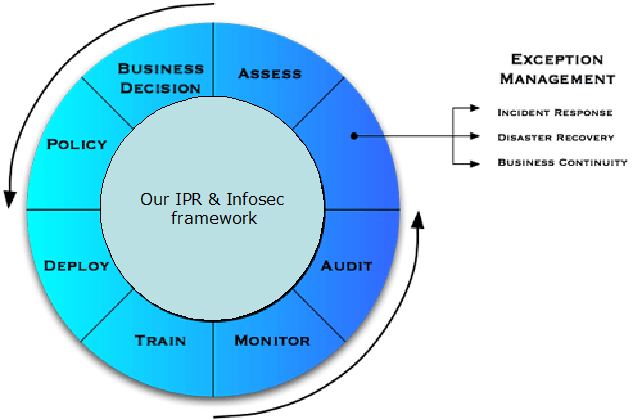 In addition this, different level (L1, L2 and L3) of security can be provided based on project and customer requirement. GTS employs advanced processes in network management and control as well as usage of several network security tools, such as Fortigate 200 A Firewall, IDS (Intrusion Detection System), Sniffer, Gateway Anti-virus, Desktop Anti-virus, and many more. We have been consistently following the ISMS standards and quality policies recommended by ISO 27001 and will be going for the certification in very near future. Our strong focus on better and consistent quality can be illustrated by the several success stories we have led during our customer engagements. Indeed, a constantly growing list of our clients and a great customer retention rate, both provide a clear testimony to our strictness towards adherence with the quality procedures and practices.